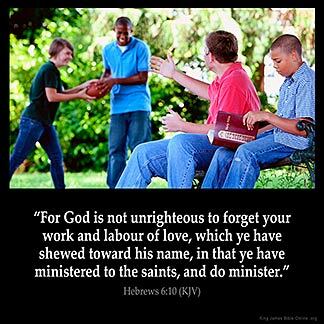 HEBREWS 6:10 KJV "For God [is] not unrighteous to forget your work and labour of love, which ye have shewed toward his..."
For God is not vnrighteous, to forget your worke and labour of loue, which yee haue shewed toward his Name, in that yee haue ministred to the Saints, and doe minister. For God is not vniust, that he foryete youre werk and loue, whiche ye han schewid in his name; for ye han mynystrid to seyntis, `and mynistren. 6:10 For - Ye give plain proof of your faith and love, which the righteous God will surely reward. Heb 6:10 For God [is] not unrighteous to forget your work and labour of love. Though the Hebrew Christians had not advanced in knowledge (Heb 5:12), yet they had shown the fruits of the love of Christ in ministering to the saints. God is not unrighteous to forget my work and labor of love toward His name. All things are open and naked to the eyes of whom we have to do. God knows the intent of my heart wether my labor is for my own profit or for His. Which puts a fear of God in me to make sure I am doing all for the Glory of God. I will have to give an account for all I do. Good and bad !!! I love B.J. Manuel 's comments below.... well said and so true. God does not forget and He will reward in due season if we faint not. I ma not to expect a return of good that I have done from the one that I showed a kindness to. God is my rewarder of them that diligently seek him. He will reward every man me according to his work . God is not unrighteous to forget my work and labor of love from my heart. if done from a outward show you got your reward !!!! God will always reward us. We just have to wait on his perfect timing and don 't give up or lose hope. He always stands by his Word. God remembers every act of love done in His name.Jesus looks on the heart and knows the intentions of the heart. He will never leave or forsake us.